The moustache have been a symbol of privilege, royalty and authority, it has long been a fundamental value of the Indian culture for men. A definite statement of male virility and stature, contemporary fashion has also glorified the humble moustache and made it a 'celebrity' with a cult following. Knowing all this fact, so what is the best way to grow and take care of your moustache? Do you need help and a perfect guide? Well look no further, as in this post, i shall be showing ways on how you can grow and take care of you moustache. Always have a good cleansing and toning ritual in place. The upper lip is one of the most delicate and sensitive spots of skin on the body. Prone to irritation and outbreaks, a good cleansing ritual using a quality face wash is of utmost importance. According to skin specialists, a foaming face wash rids the skin of unnecessary oils, pollutants and particulates, ensuring that you have clean skin that is extremely important when it comes to growing your moustache. The first step in growing your moustache is to let your beard grow out. The rate of growth below and above your jaw is variable and 9 times out of 10, a beard grows in faster than the moustache. Do not be in a hurry to trim, style and groom your beard. If you are going in for a look that is more moustache oriented, then it is advisable to let your beard grow in for a few weeks, before you decide to prune your moustache out. The beard can then be accordingly trimmed to go with the look. One of the most important things to remember when growing your moustache out is to style or trim it, when it is dry. Hair has the tendency to become a lot heavier when wet and this could lead to an uneven cut. Always use a moustache comb to first set your moustache hairs, and then a tiny pair of scissors to trim off the excess hair. Better still let a professional do it. Using a good quality moustache/beard oil to moisturize and protect your pride and joy is of the utmost importance. The oil forms a layer of sheen on the moustache and keeps it free of irritants and particles in the air, not to mention makes the moustache feel and look silky and well groomed. These days there are so many brands offering moisturizer for mustache. When you are going out, or for an interview, looking dapper and/or professional is very important. Stylists advise the use of a good quality moustache wax in order to set and style your stache, in order to keep it well maintained and in place, all at once. Not to mention the added protection the layer of wax will apply to the moustache. Exfoliation of the area under the moustache keeps the skin under the hair supple and opens up pores. The pores can often times become blocked because of particles and dust that often times make a happy home under your man moustache. Exfoliation also helps the skin's sebum (oil) production that in turn keeps the roots of the moustache happy and healthy. Like with any hair and skin product, washing it off is as important as remembering to apply it in the first place. Make it a practice to wash your moustache off twice a day. Once in the afternoon and then once at night with a good quality beard moustache wash. Always find a style what will accentuate your face shape. 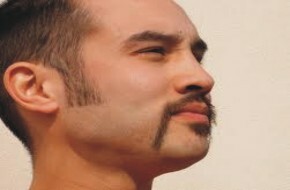 Curling your moustache, gives it an awesome roundness that further enhances its style and overall look. In order to get the perfect loop, take some wax between your index fingers and thumbs and twirl the end with a technique much the same as snapping your fingers.